Besides being a naturally busy place, the Cooper-Hewitt Library will be moving during 2011 and so there is much to be done! 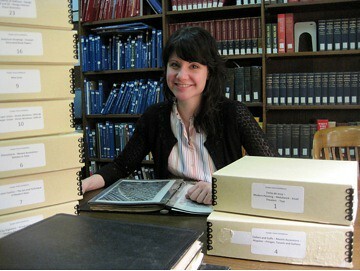 During this Spring 2011 semester, Stephanie Romano will be working on an analysis of selected titles for possible de-accession by checking SIRIS and WORLDCAT holdings, as well as determining if these titles are available online through Internet Archive. The Library is also creating an online exhibition history of our institutional ancestor, the Cooper Union Museum for Arts & Decoration. The history project covers over 140 exhibitions from the years 1933-1967 and will appear on the Museum’s website. Stephanie will be doing data entry, scanning images, creating captions and annotations from our library’s exhibition archives. Stephanie Romano will be receiving her MLS from Pratt Institute, Brooklyn, New York in May 2011. She is interested in working on projects in Archives and Special Collections, as well as the preservation of cultural heritage objects and research materials. Prior to pursuing her MLS, she received her BA in Theatrical Costume Design, and has worked as the Wardrobe Supervisor for the theatrical production Blue Man Group in New York City. What a great internship this is. I think it is well deserved especially from such a talented young woman as stephanie herself. Look at the resume on this girl! The projects that she is working on are one and unique such as the de-accession by checking SIRIS and WORLDCAT holdings, as well as determining if these titles are available online through Internet Archive. Great Job!